Nine simple words summed up a big idea when then-seniors KeJuan Weaver, Hillary Spangler and Andrew Miller filmed a video thanking those who had helped them begin chasing their dreams at NC State. Now, almost six years after graduation, this impressive group of 2013 alumni is proving that Think and Do is much more than a mantra. It’s a way of life at NC State, and it helps drive a campus toward big goals while giving students extraordinary experiences. Weaver, Spangler and Miller took full advantage of those hands-on learning experiences through the Caldwell Fellows and Park Scholarships programs. “I’m a firm believer that positive acts are contagious. Andrew and KeJuan, along with others I met at NC State, all had this passion to make a positive change,” Spangler said. The passion for positively impacting the world hasn’t wavered for Spangler, Weaver and Miller. 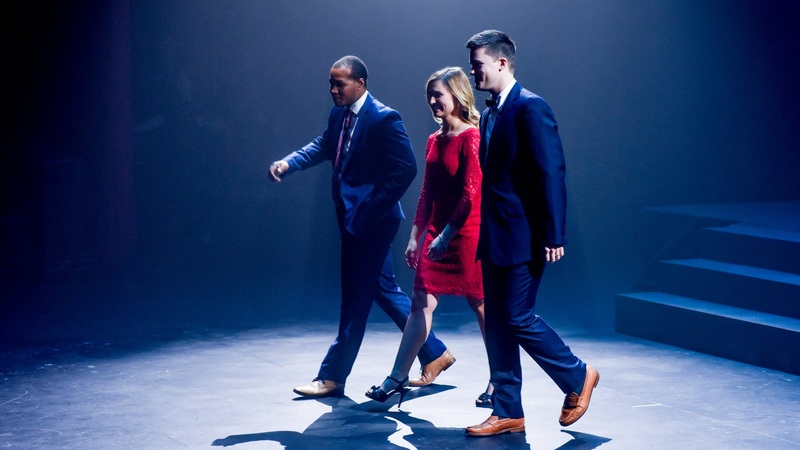 All three are doing just that, and they returned to campus in November to give thanks to donors in person during Red and White Night, the annual celebration of the ways philanthropy is transforming the university. “The farther I get away from NC State, the more I’m able to reflect on the quality of people there. A lot of universities have smart people, but I think NC State has particularly nice people who also happen to be smart,” Miller said. Spangler agreed, adding that her student experience included dozens of moments when she saw a “bigger we” at work. Success has taken different forms for the 2013 graduates. After earning a bachelor’s degree in biomedical engineering at NC State, Miller earned a master’s degree at Duke University before completing the Triangle-school trifecta by attending medical school at the University of North Carolina at Chapel Hill. The Elon native is now in the midst of a pediatric residency in Virginia, and he hopes to one day open a pediatric practice in a rural, underserved area. Miller came to NC State thinking he would end up in the medical field but credits the Park Scholarships program with allowing him to pursue his dreams in a different way. The scholarship provided a pathway to achieving his goals. As part of his senior project, Miller and others traveled to Ethiopia to help develop a better way for hospitals to get access to medical-grade oxygen. “This isn’t something that is even on the radar for physicians in the United States. You turn on the nozzle, and you have oxygen. But that’s not true in many other parts of the world. That was a neat project because we all worked together and were dedicated to reaching one goal and solving this problem,” he said. 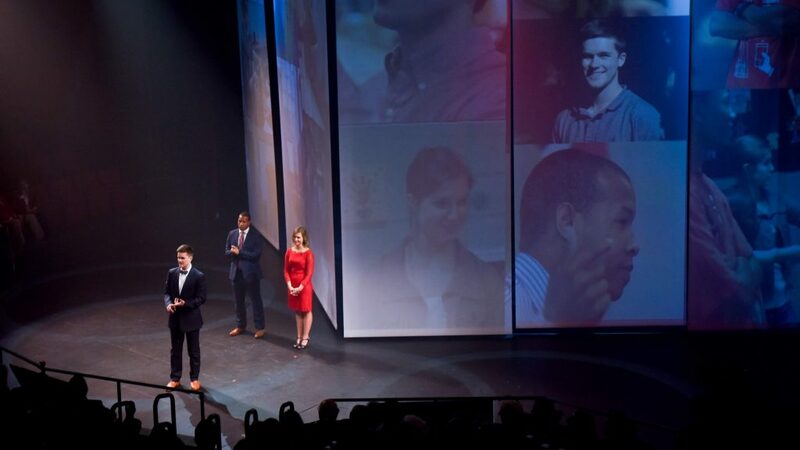 Andrew Miller (front), KeJuan Weaver and Hillary SpSpangler discuss the impact of philanthropy at Red and White Night 2018. The idea of helping others also hit home for Weaver and Spangler during their time at NC State. Both had chances to learn, grow and serve others while participating in the Caldwell Fellows program. Named for former NC State Chancellor John T. Caldwell (1959-1975), the program is dedicated to developing students as individuals and as servant-leaders on campus and throughout their lives. Spangler took that challenge to heart, and it helped her develop a passion for helping others. With her stipend, she developed nutrition programs to teach children about healthy eating habits, and the program culminated in Spangler writing a children’s book that advocates healthy living. After graduating with a bachelor’s degrees in nutrition science and biology, Spangler too went up the road and attended medical school at the University of North Carolina at Chapel Hill. She’s now completing a pediatrics/internal medicine residency. Spangler said she embraces the idea that small acts of positivity can change the world, and said she’s thankful that donors helped create the experience she had at NC State. Weaver is also focused on giving back in more ways than one. After graduating with a bachelor’s degree in elementary education, he has taught for the past five years, the first two in Wake County and the last three at a public charter school he helped get off the ground in Dallas, Texas. KeJuan Weaver, Hillary Spangler and Andrew Miller discuss the impact of philanthropy at Red and White Night 2018. “One of the things I try to give my students is the idea of giving back to wherever you come from. Our goal is for our students to go to and through college, but we also share the idea of giving back to your community,” Weaver said. Weaver said finding a community of like-minded people in the Caldwell Fellows program, coupled with extraordinary experiences such as a wilderness expedition, were key in his college journey. “It’s different in the Caldwell program, and I was so grateful to be a part of a group of individuals that loved the idea of service,” he said. Like Spangler, Weaver said donors who support programs that help students will never be able to fully understand the impact they’ll make on a person’s college experience.